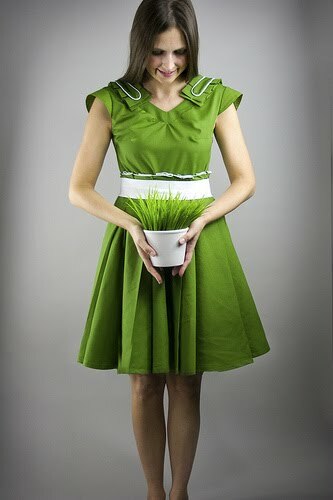 Grosgrain: VOTE FOR #7 Grosgrain's The Lawn Frock GIVEAWAY!!!! CLOSED. VOTE FOR #7 Grosgrain's The Lawn Frock GIVEAWAY!!!! CLOSED. (UPDATE) THIS DESIGN HAS BEEN CHOSEN AS ONE OF THE 15 FINALISTS. IF YOU LIKE THIS DESIGN AND WOULD LIKE TO SEE IT PRODUCED BY SHABBY APPLE PLEASE GO HERE AND VOTE FOR #7!!!! Okay, here is my second last minute Shabby Apple Dress design for Shabby Apple dresses. Originally I had just intended to make only one. Then last minute I thought up this green and white piece and it just killed me not to enter it. So for the past few days I've been hard at work finishing up the dress. I hope you like it too. I really loved the way the white looked against the grass green color of the dress. So crisp and sunny. I really loved the design of the collar. It bears a V-neck trim that attaches to a tiny gathered portion of the front bodice. 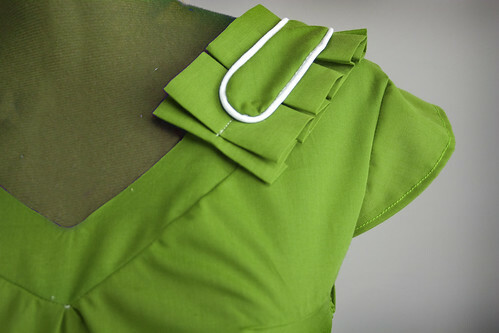 Then I ruffle pleated a piece of matching fabric and added on top of the collar. I then added a white piping trimmed piece to keep the two in place. The sleeves are tiny and capped just right for warm spring weather. I had my beautiful friend Abi model for me this time. Unfortunately, she was too tall for my tiny basement studio. So we had to ditch her pretty white heels at least for most of the shots. Unfortunately we were resigned to taking the photos indoors. It now gets dark around 4:30pm here. Ugh. If not for Christmas, I'd really dread this time of year. I wish the holiday season lasted about one month longer so that the winter didn't seem so long and dreary. Fortunately, I had these potted ornamental grass pieces on hand. But I have to admit that it's very difficult to photograph spring in the throws of November. By now many of the trees have already lost all of their leaves. I have a feeling it's going to be a long, long winter. But this spring I'm going to enjoy myself. No more pregnancy sickness. I'm going to wear dresses and bake cold apple pie and have picnics and go on bike rides and just be really happy. That's my new year's resolution. Yesterday I was thinking that I've been sick for so long it's difficult to remember what it's like to be well. I'm sure many of you have similar pregnancy stories. I don't recall being this sick with either Lily or Molly. When Abi came over last night to do the shoot I admitted that I usually don't put make up on, even to go out in public and when I do I leave it on until the next day and just wear what's left over. I even wore sweat pants out on Halloween night. Whatever. At this point, I'd rather be comfy than sick. Mmmm, look at that popsicle. It's lime. When I opened the box I expected them to be green but I think white turned out better anyway. It was actually really tasty and I ate it throughout the shoot. Nice treat for baby. I bought them at Giant. They're called 'Whole Fruit' bars and they also come in Mango and Strawberry. Very spring, very refreshing to eat on a sunny porch. If I had to sew this dress over again I'd probably use a stiffer material. It was difficult for me to find the right color of green in the right sort of fabric. I would have liked the top of the skirt piece to stick up more at the top by maybe a half an inch? But the pleats really make the dress quite full at the bottom. I didn't need any under skirt to fluff this out. I used a circular shape which also helped to create an A-line. We also talked about Christmas and gifts and how she possibly wanting a nice camera for Christmas. I was eager to give her some DSLR advice. I really don't know what to get Brian for Christmas. At first I loftily thought, some kind of vacation? Then I remembered, you can't fly being 9 months pregnant. Duh. You can't take a cruise to the middle of the ocean! You really can't do too much. Then after baby? I think it might be quite a while before we can go on a nice tropical location sans babies. I don't think I could possible ask someone to watch all three under 5yrs. That's quite a tall order. What about some of you, what has been your experience with kids and vacations? I'd say this dress would fit a size 2-5. If you'd like to win this dress just link to this post either using the 'create a link' at the bottom of this post or simply creating a post on your blog and including this link. If you have any questions see the "questions and answers" link at the top. If you use blogger just use the "create a link" link at the bottom of this post. If you don't use blogger, that's fine too. Just create a link on your page as you normally would and I will see it using Technorati. I LOVE this dress...especially the color. I'm a red head with green eyes and I have wanted just this color green dress forever! Unfortunately I do not fit in the 2-5 range. But I love the creativity you put in to this dress. It looks runway quality! I love the dress! Very Beautifull! I have linked to my blog...Southern Institute for Domestic Arts and Crafts. Unfortunately, I am not within the size range for this dress, BUT I know someone who is and it would make a great gift! 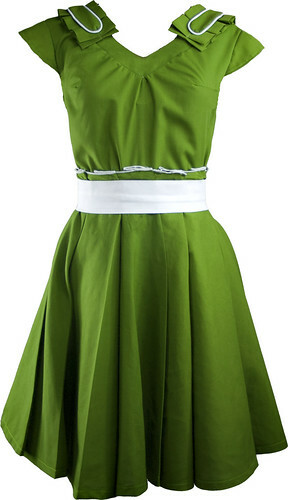 I absolutely adore this dress, green is my favorite color, does great things for my green eyes! Yes, Spring....wouldn't it be fun to wear this in the Spring, and Summer...and...I hope I win this one, it would fit me perfectly! Oooo, I agree with Kelly. A candy pink and white would be yummy! Kathrine please don't enter me (wouldn't fit in a million years! LoL!) But I had to let you know how cute I thought the dress was. this is such a beauty! i can't believe you designed and made it! i just posted a link on my blog and now i will cross my fingers! This dress is gorgeous and reminds me of spring pastures!! I posted the link now I will wait and see!! this dress made my morning. thank you. The lemon dress you made was lovely, but I think this one is even more beautiful! If only I could go down a size or two I would absolutely enter the giveaway. Any chance you'll be posting about some more thrift store refashions soon? Wow this is seriously stunning! Of course I've linked to it! Love it! And the blog, too! You are so talented! I posted: http://sweetnsimplestuff.blogspot.com/2009/11/beautiful-dress.html. Really like the color of this dress...very pretty! what a vibrant dress, hope to call it mine!! You are unbelievable! Seriously... I would love to have just one ounce of your talent. This is AMAZING! I love it! I hope I win (I linked on my blog)! Your design skills never cease to amaze! wow. I linked. This is beyond perfection. LOVE it. What a lovely dress! You are so talented, Kathleen! This green is such a great color. 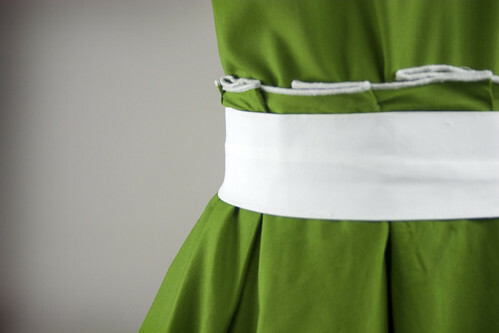 In fact, I lost the belt to my black quilted winter trench and so I improvised with a sash in this exact color! "Think Spring" through winter is definitely my moto too! Once again- linked to my blog. I really love the color on this dress. This color green makes the blue come out in my eyes:) So, obviously, pick me!! This is perfect since I have vowed to make dresses a bigger part of my life! This dress is absolutely gorgeous! You are incredibly talented. It was linked faster than you can say linked. I blogged stating it would be a perfect dress to wear while my family makes it's first trip to Mexico for my baby Evelyn Marie to meet her Abuelita y Abuelito. What a beautiful design and color. I have fair skin, dark brown hair with green eyes. I LOVE it! Love the shade of this dress its a stand out! the skirt pleat is my fave part of this dress its such a fun effect! Reading about your cooler weather makes me slightly envious as we are having a heat wave here in Sydney Australia! I love this dress, I have never worn a dress in my life!!! But I would wear this one in a minute! I love it - you really do have a great talent for these dresses - I thought the yellow one was good but... wow! this one too!! This is one gorgeous dress - just right for Christmas parties here in Australia where the weather is warm and sunny right now. After pregnancy,birth - last Christmas (and breastfeeding) I have been unable to wear dresses but am finally getting my baby to drink from a sippy cup so I can feel like a lady again in a dress instead of t-shirts all the time. I *think* this is my size as our sizings are different here but I bought a size 4 pair of jeans over there in the US that are a great fit so here's hoping! (that the kids tag along to) needs to be followed with energy burning kid activities the next day, especially when they are pent up in hotel rooms or strapped in strollers most of the time. Off to link in my blog! Ahh! That dress is so cute. I really like the green...stands out! I love love this dres!!!! the perfect shade of green!!! Oh my gosh! I love this dress! I wish I could sew like but the best I can do is a semi straight line. I did a link to my blog, mwvasquez.blogspot.com. Thanks for doing this give away! OMGoodness, LOVE it!! The color is perfect and just the right size!!! Ooo, this is SO my color and my size, I would LOVE to win it! This dress was made with me in mind. I don't know if you know that, but it was. Green is my favorite color. I love bright colors and I love this dress. See you made it with me in mind. Love you for that! This dress is so joyful. I love it. I am a size 4 and love green! I usually dress in black, whites and grays but i love to wear bright colors when it is something very special like this dress. It is so wonderful and makes me want to put a record on and dance with my hubby around the kitchen. I love it. One of these days I'm hoping to get lucky and win one of your amazing giveaways! Made a link for this and your other shabby apple dress love them both. They would never fit me but my sisters are in love with them so I entered for them. this green is gorgeous!!! beautiful, thanks so much! LOVE everything about this. Hope it even *fits me*!? Good luck with the contest: I hope you win! Your springy dress is beautiful and so is your friend modeling for you! Unfortunately, after just one pregnancy its size would not fit me! Best of luck to all then! I stumbled across your website and I'm in love. Especially with this green dress. As a seamstress, I can really appreciate the effort that went into making such a well structured and tailored dress. I also LOVE this dress!!! So cute. I love the color, and the design is beautiful! I linked!! Oh, I love it! Pick me! What do I have to do to bribe you to pick my name? I thought the lemoncello was gorgeous, but I LOVE this one! you are amazing. your designs are thrilling and so perfectly darling. i hope to someday design and sew 1/2 as good as you. LOVE LOVE LOVE_ I WANT TO ORDER THIS IF IT DOSNT COME OUT ON THEIR LINE! PLEASE MAKE MORE! Fingers, toes, legs, arms and eyes crossed. I look quite silly but it is worth it! What a gorgeous, gorgeous dress!! I'd LOVE this dress for myself...although I still need a few more post-baby months (my youngest is 5 months). Even more, I'd love it now for my oldest daughter...and later, her THREE SISTERS! A great classic piece for all of us! That dress is sooo adorable! Green is my absolute favorite color too! The details are simply amazing! That dress is amazing. Is there any chance you might create a pattern for it that I could buy from you?? I also love the dress and finally received sufficient motivation to start an account so I could participate in these contests. I have loved everything I have seen before, but now I will be linking your blog as often as I dare. This is an eye catcher. I love the design,especially the waist line. I have green eyes and would love this. I wish I could create something so elligant. Love it! Please enter me in for the giveaway! My fingers are crossed all the way in Oklahoma!! You are so uber talented!! I linked up. I adore this dress! It is too cute for words! I love this dress, if I win I might just have to finally make something for myself. I'm pregnant right now too and would LOVE to win this gorgeous dress as motivation for me to fit in after my first baby! I love this! I can't believe you made it--it's gorgeous. Love the colorl. I linked on my blog!! My fingers are crossed crossed crossed!! just my size... ugh! would LOVE to have it. :) Voted for you in the shabby apple contest. Best of luck!! really love it! I have linked to my blog. It's totally 'my' colour. Your designs have always something special... it's fabulous!!!! number 7 is a locky number! so what about my nomber? Its a very beautiful dress and I will be glad to join your site and giveaway..
Adorable. I would love to win this dress, and I'm voting for your dress to win with Shabby Apple! I just LOVE the color, the style, and that flowing skirt and ruffles are fantastic! Good luck to you! I absolutely love this dress. I voted for you! Best of luck! Another beautiful dress! I voted for you too. I hope you win!!! I linked to this dress. It is GORGEOUS and is in my size range! What an amazing dress, I just love it. The colour is just wonderful and the design is so beautiful. I'll keep my fingers crossed, hoping to win. I just love your dresses! I am so very obsessed with this dress. Linked! I couldn't imagine a more novely dress! What an absolutely gorgeous dress! You are so talented. Beyond words! I hope you win. I voted. And asked a few people to vote too! Every day I come back to look at this dress. I am just so in love with it! You are such a talented woman. This is such a lovely dress. I hope you win the Shabby Apple contest! Best of luck! I put a link on my Facebook page. this is so adorable! i hope you win! i voted!!! I love this dress and think it would motivate me to lose the baby weight. It makes me wish I could sew clothes. this is my new favorite dress. abi looks hott as ever.